Interestingly enough, I found the idea for this hairstyle from an article on 2011 Hair Trends which highlights the new trends in high fashion being various forms of twists! They found that Prada, YSL, and Blanc de Chine are all using twist hairstyles in their Spring 2011 fashion shows. Even neater, the author features one of our oldest twist styles from YouTube. 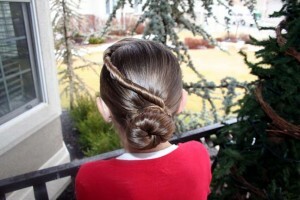 I have always loved using twists in my hairstyles and have many of them listed on this website. What I love about this particular style is that it has a very modern look to it, and it can be used for pretty much any occasion (Prom, Homecoming, ballet, weddings, formal events, etc). You can actually twist the front section any direction you want, as each provides a little bit of a different look. Items Needed: Rat-tail comb, brush, water bottle, two hairbands, hairspray. 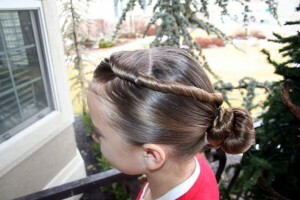 If you like this hairstyle… be sure to let us know!